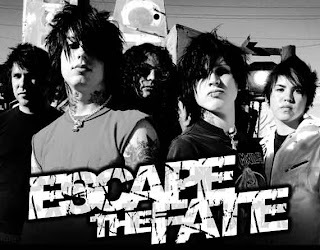 Escape the Fate is an American rock band from Las Vegas, Nevada, formed in Pahrump, Nevada in 2004. Their debut full-length album, Dying Is Your Latest Fashion, was released on September 26, 2006. Their second full-length album, This War Is Ours was released on October 21, 2008. To date the band has released two full-length studio albums, three EPs, and six music videos and consists of Craig Mabbitt (vocals), Max Green (bass), Bryan Money (guitars) and Robert Ortiz (drums).